This guide provides you with detailed information on how to place an order with BullionStar. You can place orders online 24/7, call us at +65 6284 4653 or walk in to our shop to place your order. There is no minimum or maximum restriction when purchasing from BullionStar. 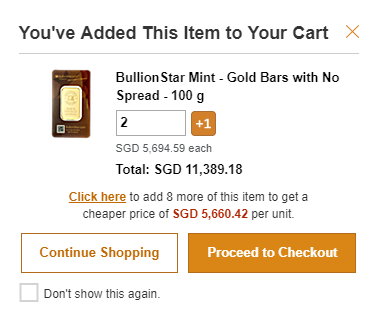 Step 1: Click on "Buy Gold & Silver" in the left hand side of the top menu and from the drop down menu, select the product category you want to go to. Alternatively, you can search for a particular product using the search box above the top menu. This search box also allows you to select popular products from a drop down list. Step 2: If you wish, you can filter products by clicking on "Filter Products" on the product list screen. You can filter products based on weight, Issuing Country, Availability and Year. Step 3: Enter the desired quantity of the product you would like to order in the field to the left of the "Add to Cart" button. Click on "Add to Cart" to add the product to your Shopping Cart. Step 4: The item will be added to your Shopping Cart and a pop-up box will appear showing the item added. From the pop-up, you have the option of either "Continue Shopping" or go to the Checkout by selecting "Proceed to Checkout". Your Shopping Cart can also be opened by hovering the mouse over the Shopping Cart icon at the upper right-hand side of the webpage. Step 5: If you select "Proceed to Checkout", the selected item(s) are added to your Shopping Cart and are displayed on the Checkout page. From your Checkout list, you can edit the quantity of each item you have selected or remove an item by clicking on the "X" next to its listing. Step 6: If you selected "Continue Shopping", you will return to the product screens, where you can add further items to your Shopping Cart by simply repeating step 3-4. Step 7: Select delivery method by clicking on the drop-down box under Delivery using the the arrow on the right hand side. You can opt to have your purchased items stored in Vault Storage, personally collect (pick up) your products, or have your purchased items shipped to you by Courier. Note that if you have placed an order for the BullionStar Savings Program (BSP), the only delivery option available will be Vault Storage. Step 8: Select payment method by clicking on the drop-down box under Payment using the arrow on the right hand side. You can pay by bank transfer, PayNow, cheque payment, cash, NETS, card or by the crytocurrencies Bitcoin, Bitcoin Cash (ABC), Ethereum or Litecoin. 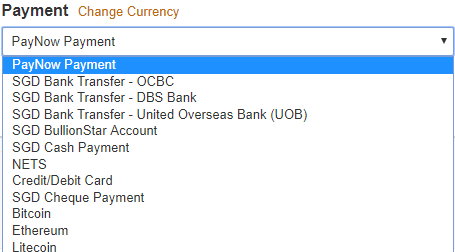 Note that you can change the currency you wish to pay in by clicking the "Change Currency'" link next to the Payment heading. Available currencies include SGD, EUR, USD, SEK, JPY, AUD, as well as the cryptocurrencies BTC, ETH, BCH and LTC. Step 9: If you are logged in, your registered address will be your default customer/shipping address and will be displayed under Customer Information. You can change the address if you would like to have your order shipped to another address by clicking on the "Edit" button. If you have yet to create an account, fill in the empty fields under "Customer Information". If you are logged out but have created an account previously, please login. If you are placing an order for Vault Storage for the first time, you will also have to select a PIN code which will be mandatory to enter in subsequent transactions. 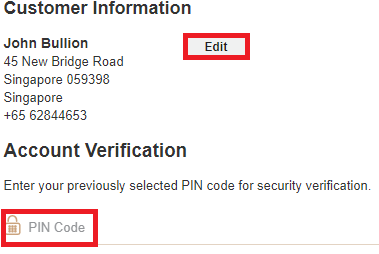 If you have previously selected your PIN code, input the PIN code under "Account Verification" if requested. Step 10: Read the Terms And Conditions and check the checkbox if you agree to them. Lastly, check the checkbox to acknowledge that your order is binding. Lastly, click on "Place your Order" to submit your order. Step 11: An order confirmation will appear. Your order number as well as the payment instructions can be found on the order confirmation. The order confirmation will also be sent to your e-mail address and as an SMS text message to your mobile phone number. If your purchased products for vault storage, your products will immediately be visible under your Cash & Bullion Dashboard as payment pending. We will process your order as soon as your payment has been received.